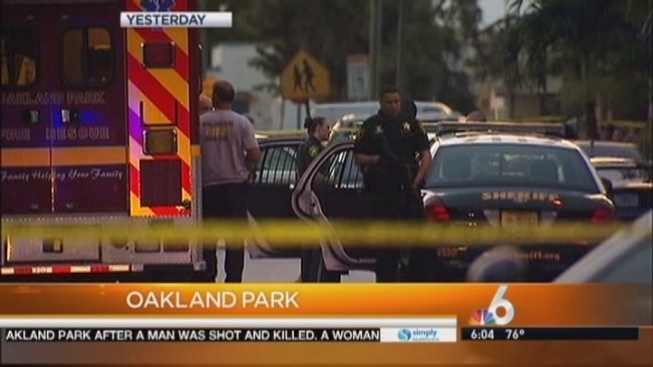 The Broward Sheriff's Office is looking for a gunman who shot and killed a man and wounded a woman in Oakland Park Sunday. The shooting happened just after 7 p.m. in the 300 block of Northwest 40th Court, according to the BSO. The man, identified by relatives as Kenny Sewell, was killed at the scene. The woman, who relatives said was Sewell's girlfriend, was treated at Broward Health Medical Center for injuries to her arm and was released. Authorities and a SWAT team searched the area with a helicopter and K-9 units but weren't able to find the suspect. BSo detectives are interviewing witnesses and investigating the shooting, BSO spokesman Mike Jachles said. Cassandra Thompson, Sewell's aunt, fought back tears as she spoke about raising him. "[I'm] hurt, cause I'm tired of losing all my loved ones. It's just hard," she said. "I raised him and his sisters and brothers, all six of them, with my kids, his momma passed and I adopted them as my own kids." Anyone with information is asked to call Broward Crime Stoppers at 954-493-TIPS.